Girls First Bra - Shopping for a training bra for the very first time can be both exciting and daunting. There are so many options out there that it can be overwhelming, and you might be tempted to just grab the first style you see. We'll take the mystery out of it and show you how to choose the right size and get the very best fit. Follow along with these easy tips for a first bra experience that's fantastic. Don’t just assume you’re the smallest size because it’s your first bra. A proper fit starts with taking your measurements, which can easily be done at home. Enter your measurements into an online bra size calculator or bring them with you to any reputable lingerie store to have a sales associate help translate them into the right size. Even the most accurate bra measurements can’t guarantee a perfect fit every time, since each bra style is cut differently and brand sizes vary slightly. Once you’ve selected a few styles in your size, make sure you take them into the fitting room for a quick try. Don’t be afraid to try one size up or down to for a great fit. Keep in mind that lingerie brand sizes can vary, so don't worry about what the size tag says. Many young girls start out wearing simple wirefree bras that come in easy to fit bra sizes - xsmall, small, medium, large, and xlarge. A girls first bra should fit fantastically when you’re standing still, but since no one spends much time standing still in everyday life, you should also try a few poses in the fitting room to make sure it works well for you. Don't be afraid to channel Madonna and strike a pose! Try leaning forward and reach up with your arms above your head to make sure it doesn’t ride up or that you’re not spilling out of the top or bottoms of the cups. Training bras have to look great with what you're wearing, and the best styles are those that disappear completely under your clothing. A great way to check it out is to wear a simple tank top or t shirt when bra shopping and always make sure to slip it on over any bra you try. This will show you whether or not the outline is laying smoothly against your skin, the fabric and color don’t show through, and that the back band doesn’t create any unsightly lumps or bumps. Want to get a better idea of how well your bra will look over your clothing? Take an extra moment to pop your shirt on when you’re in the fitting room. Don’t be shy when you're in the store bra shopping. Speaking up and asking a sales associate for help is a great idea if you're buying your first bra, so you can be sure you’re getting the best size and fit for your figure. Lingerie and intimate apparel professionals who work in the industry know which styles are the best picks and how to get the size just right. They can help you narrow your search for the right size, and they can help adjust the straps and back band properly for a super look and feel. 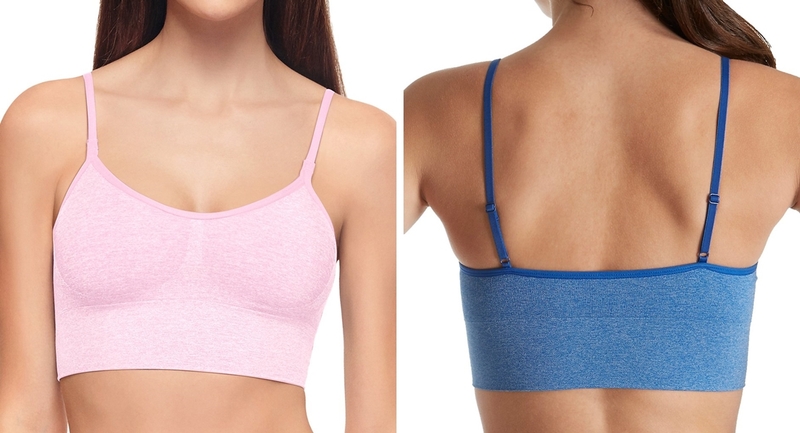 Overwhelmed by the different types of bras and don't know which style to choose? Ask yourself what the bra is for? Is it for sports? For practicality? Or just for fun? You’ll quickly learn when shopping for your first bra that there are some pretty styles out there that are also super uncomfortable. If a training bra doesn’t feel great when you try it on, move on to the next bra. Keep trying until you find one that looks and feels great. You don't want to be constantly tugging and adjusting a training bra your first time out. Try several styles and look for ultra soft fabrics like microfiber and cotton with a touch of spandex - softer materials that stretch offer an easier and more comfortable fit. You should be able to slip it on and forget about it, so make sure your bra is as comfortable and effortless as possible.